Irving Berlin once wrote, "The song might be over, but the melody lingers on." That, according to a paper from the Federal Reserve Bank of San Francisco (San Francisco Fed), sort of describes the Great Recession. A decade after the financial crisis and recession the U.S. economy remains significantly smaller that it would be had its pre-growth trends continued. Three Fed researchers, Regis Barnichon, Christian Matthes, and Alexander Ziegenbein, say this diminished level of output could result in a lifetime present-value income loss of about $70,000 for every American. Not only is the U.S. GDP, adjusted for inflation, well below the level it seemed inclined to achieve based on its growth before the recession, but so are the economies of the United Kingdom and other European counties. This diversion isn't unique to the most recent crisis, however. Studies of other downturns have indicated that gross domestic product is typically about 9 percentage points lower five years after an extreme financial crisis. This time however, the authors say, the effects appear more severe and academics and policymakers are "rightfully worried" that output might not revert to the level implied by the black dashed line in Figure 1. The figure displays the series of downward revisions the Congressional Budget Office (CBO) made to its estimate of potential output to what might be expected once the transitory effects of a cycle have dissipated. After 10 years of revisions the actual U.S. GDP (solid blue line) converged in 2017 with a new potential level (dashed green line) that was about 12 percentage points below that implied by the National Bureau of Economic Analysis (NBER)* update in July of this year. GDP updates from other sources, including the San Francisco Fed, show similar results. The CBO's analysis attributes a large part of the shortfall to a reassessment of trends already in place before the recession, but the authors of the current paper find it was the financial crisis itself that was largely responsible and that the GDP is unlikely to revert to its pre-recession potential. Results of studies of earlier economic disruptions are mixed. Some find that they are generally followed by a large and persistent decline in output while others try to explore whether surprise events in the economy can be traced back to financial disruptions and report mild and transitory effects. One way to reconcile such conflicting views is to assume that the relationship might be asymmetric. That is, in a strong performing economy an adverse financial shock may disturb the economy's ability to handle risk and prevent some sectors from financing potential investments. In a poorly performing economy fewer such investment opportunities may exist. The authors constructed a model to explore any such asymmetries and found that, indeed financial conditions may cool a hot economy but might not heat up a cool one. 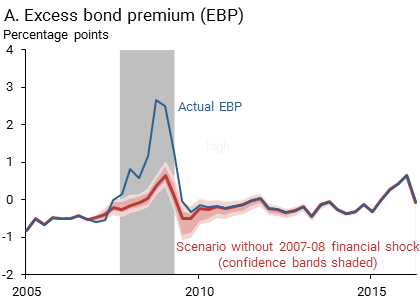 The San Francisco Fed model combined information on economic conditions, notably GDP, with information on financial market conditions measured by the excess bond premium (EDP) as a proxy for the risk-bearing capacity of the financial sector. It measures how the additional amount corporations have to pay to borrow in the bond market relative to the government, net of compensation for the risk that the corporation will default on its obligations. This variable is therefore a good measure of private credit availability. The model uses the many episodes of mild financial market disruptions to calculate how future changes in financing conditions are likely to affect the economy and to assess how much of the gap between current GDP and its pre-crisis trend level is explained by the financial crisis. To do this, the authors calculated, in Figure 2, how the GDP would have fared without the disruptions of 2007-08. They only used data from 1973 up to 2006, thereby excluding any information from the most recent financial crisis that could contaminate estimates. Without the events of 2007-08, the EBP increases only mildly, driven by its normal response to a deterioration in economic conditions. Indeed, during recessions, the overall appetite for risk normally decreases as the financial sector becomes more risk-averse or simply has fewer funds available to lend. 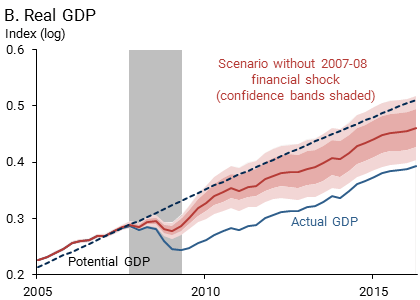 Without the large adverse financial shocks experienced in 2007 and 2008, the behavior of GDP would have been very different. It would most likely resemble the less severe 1991 recession, with GDP declining by only 1.5% and reverting to close to its pre-crisis trend level in a few years. This behavior is in stark contrast what has actually happened, a GDP that has not yet reverted to its pre-crisis trend. 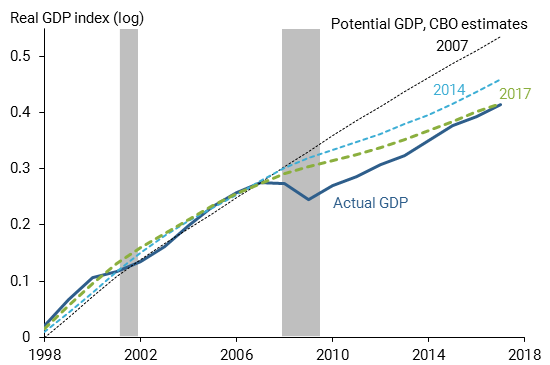 A mild recession would imply that the gap between output and potential output from the 2007 CBO estimate (dashed black line) would only be about 5 percentage points instead of the 12 percentage points by the end of 2017. The means a net decline of roughly 7 percentage points. In dollar terms, it represents a lifetime income loss in present-discounted value terms of about $70,000 for every American. This simple calculation takes the reading of GDP per person in 2007 (approximately $50,000) and assumes an annual discount rate of 5%. Economists still lack a solid grasp of the mechanisms through which market disruptions can produce such persistent effect on output, but one explanation might be the highly peculiar behavior of economies with financial frictions. Two of the authors wrote earlier that, with financial frictions, a large adverse shock can take the economy away from its normal growth path for a very long but finite time. Another possibility is that episodes of financial distress could force businesses to cut research expenditures or could prevent high-growth potential start-ups from emerging, which could permanently affect the economy's future productive capacity. The paper concludes that the responsibility for much of the gap between current output and what was expected because of pre-crisis trends is the result of the crisis, even 10 years later. "This suggests that he economy is unlikely to regain this large output loss and GDP is unlikely to revert to its previous trend level. Financial market disruptions can have large costs in terms of societal welfare by causing persistent losses in the level of GDP. This suggests that finding ways to prevent or contain future financial crises is an important research and policy priority." *The National Bureau of Economic Research (NBER) is an American private nonprofit research organization well known for providing start and end dates for recessions in the United States.